Best-selling author and illustrator Peter Reynolds will be featured at a presentation and book signing hosted by Fundamentals Children’s Books. The event is scheduled from 6 to 7:30 p.m. on Monday, Jan. 29 at The Willis Education Center, 74 W. William St., Delaware. Best-selling author and illustrator Peter Reynolds will be featured at a presentation and book signing hosted by Fundamentals Children’s Books. The event is scheduled from 6 to 7:30 p.m. on Monday, Jan. 29 at The Willis Education Center, 74 W. William St., Delaware. 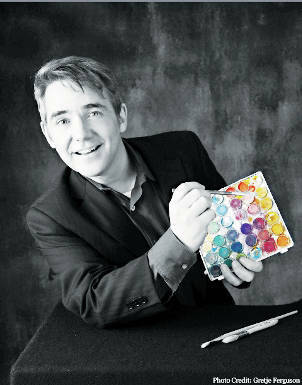 Reynolds is best known for his children’s books about “authentic learning, creativity and self-expression,” including “The North Star,” “Ish,” and “The Dot.” He has won a number of awards, including the Oppenheim Platinum Toy Award, and the Christopher Medal, as well as the American Library Association’s Carnegie Medal of Excellence. Reynolds’ award-winning publishing work also includes the best-selling Judy Moody series written by Megan McDonald, and Judy Blume’s Fudge series, His collaboration with Alison McGhee called “Someday” spent two months on the New York Times Best Seller list for Children’s Books. Together with the Burkinabe model and activist, Georgie Badiel, he has co-created “Water Princess,” which tells the story of Badiel’s homeland of Burkina Faso’s need for aquifers. Reynolds lives in Dedham, Massachusetts and is the co-owner of his family’s book store, The Blue Bunny Bookstore. He is the founder of the civic-powered revitalization group Dedham Square Circle. Organizers note that Reynolds will only autograph “Happy Dreamer” and “The Word Collector” at Monday’s event, which is sponsored Scholastic, publisher of the two titles. The books will be available for sale that evening, but it’s recommended to contact Fundamentals to reserve copies and receive a presale discount. For information or to reserve copies of the books, call 740 363-0290. Or go to funbooksandmore.com.